AEA has provided engineering services to the Triborough Bridge and Tunnel Authority (TBTA) for Queens Midtown Tunnel Design for Project QM-40 Tunnel Leak Control. 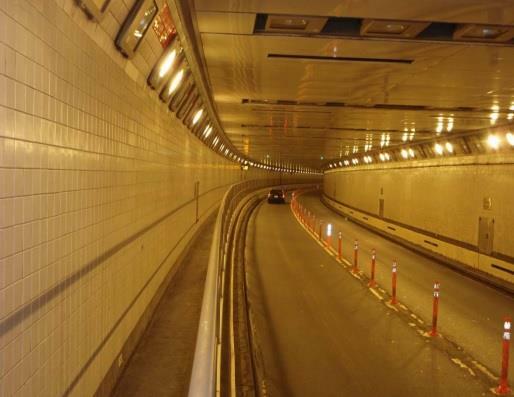 AEA was tasked to complete the electrical power distribution system to feed the tunnel lighting. The Queens Midtown Tunnel consists of two tubes that are both over 6,200 feet long. Both tubes of the tunnel flooded during Hurricane Sandy and damaged the electrical infrastructure. AEA reviewed as-built plans and conducted in depth site visits. The existing panelboards designated for tunnel lighting were in good condition and suitable for reuse. The existing tunnel lighting was comprised of HPS fixtures. The tunnel lighting fixtures were replaced in their entirety with new LED fixtures under proposed design. Approximately 2,200 LED fixtures were installed for tunnel lighting final conditions. The fixtures were fed from lighting panelboards within the Queens and Manhattan Ventilation Buildings. Installation of LED fixtures, which have a lower load than High Pressure Sodium, reduced the quantity of circuits required. The reduction of circuits enabled panelboards to be designated as spare panelboards for unknown future use. Threshold lighting was utilized as required within entrance and exit zones to ensure a smooth transition for vehicular traffic entering/exiting the tunnel. One panelboard in each ventilation building was dedicated for feeding threshold lighting. Due to limited space, the conduit and pull boxes feeding the threshold lighting were installed in the ventilation ducts. One panelboard in each ventilation building was dedicated for emergency tunnel lighting. Additional emergency lighting fixtures were installed to illuminate exit doors. AEA coordinated with other disciplines as required, including installation of an emergency evacuation lighting system. Design plans showed detailed conduit routing and equipment schedules for all lighting panelboards. Voltage drop calculations were performed to adequately size cables. Overcurrent protection devices were sized to avoid over heating of cables. A proposed dimming control system is the priority control for tunnel luminaires.